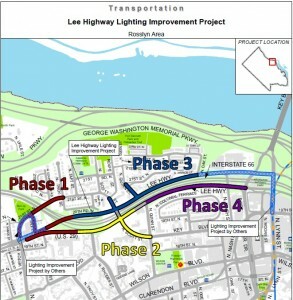 Lee Highway between North Veitch Street and Fort Myer Drive. The project is substantially complete with new streetlights between North Fort Myer Drive and North Veitch Street along Lee Highway that are now up and working. Final restoration work, which includes grass seeding, will occur in the spring. A public meeting was held in December to demonstrate the style of lights and LED technology that will be installed with this project. A construction overview and anticipated impacts was also provided. Demonstration Handout. In October, the County Board approved a $2.2 million contract for the upgrade of new LED (light-emitting diode) streetlights along a 1.5-mile stretch of Lee Highway, between North Fort Myer Drive and North Veitch Street, as well as on adjacent local street approaches. Watch County Board Chair Mary Hynes discussing the project on Arlington TV. 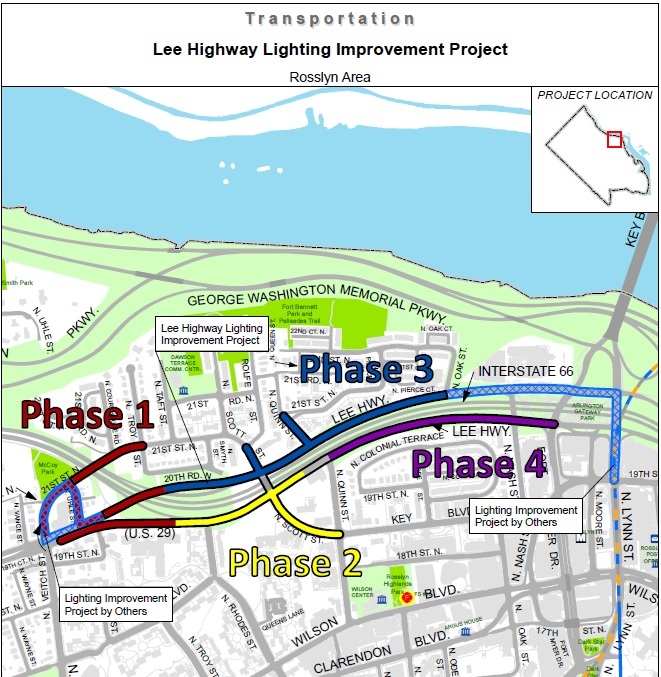 The Lee Highway Streetlights project will replace the existing lighting system, which was installed several decades ago and is prone to extended outages. The goal of the project is to improve safety for all roadway users (pedestrians, cyclists and drivers) in a high volume area. There was significant participation from the community in helping us identify this high priority project. Removing 60 existing poles and underground utility work. Installation and programming of light-emitting diode (LED) lights– for different effects such as dimming at night and flashing (for emergency purposes). 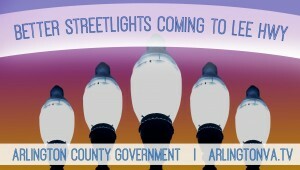 Arlington began upgrading streetlights to LED technology in 2010 along both residential streets and major corridors. These LEDs modernize the network, reduce overall costs and minimize the environmental impact.